She is known as one of the world's most flawless stars who is barely ever seen without perfect make-up or with a hair out of place, but Victoria Beckham claims she isn't always so glamorous. Instead of heading to a Hollywood hotspot or a five star restaurant at night, the mother-of-four claims she would prefer to relax at home like any other tired parent. 'Honestly, once the children are in bed I’d rather work or shove on a face pack and pluck my eyebrows,' revealed the 39-year-old as she appeared in her 10th Vogue magazine issue. 'By the time Brooklyn’s finally gone to bed, it’s all I’m fit for. Really, we’re much more normal than people think,' David Beckham's wife of 14 years told AustralianVogue when she posed on the cover of the September issue. The former Spice Girl and mother to Brooklyn, 14, Romeo, 10, Cruz, eight, and Harper, two, is more interested in spending time with her husband and kids than anything else, especially now that the famous footballer has retired. 'We’re all so proud of David,' said Victoria. 'Having supported him at clubs all over the world for the past 15 years and seen how he has been an inspiration not just to me and the children but also to millions of people, we are now just really excited at the prospect of spending more time as a family. On the final morning of Paris Fashion Week, Naomi Watts, Jessica Chastain, Elizabeth Olsen and Lily Collins eagerly perched on their front row fashion pews waiting to see what delights Marc Jacobs had in store for his A/W'13 Louis Vuitton collection. Marc's show was all about intimacy with a walk-of-shame vibe which saw sultry models emerge from hotel doors and sashay down the catwalk in various states of dress and undress. Victoria first wore the boudoir-inspired dress to Wimbledon earlier this year, proving that once again, we can always count on VB to bring the style no matter what the occasion. She looks just as stylish whether she's gracing the cover of yet another magazine or at a sporting event. Previously seen on none other than Kate Moss, this lace-edged negligee dress is the perfect combination of pretty styles. 'Everyone would file in and act so inscrutable. I’d think: "Um, did anyone like it?" No-one would say anything, so I’d just gabble to fill the embarrassing silences – even to the Japanese, who didn’t understand a word I was saying,' she told Vogue Australia. The glossy magazine Down Under is one of the many Vogues that Victoria has appeared on around the world including UK, Russia, India, Turkey, and most recently, China. Victoria surprisingly swapped her designer dresses and high heels for cowboy boots and jeans when her and David took their three sons horse riding on August 1. 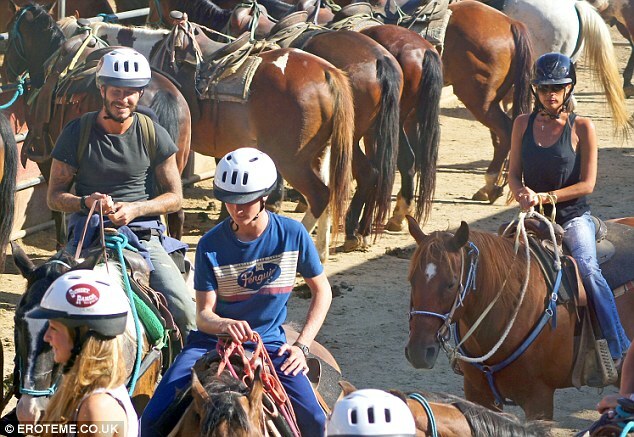 The adventurous family saddled up at Hollywood's famous Sunset Ranch to go on a group trail ride through the canyons weaving above the city.